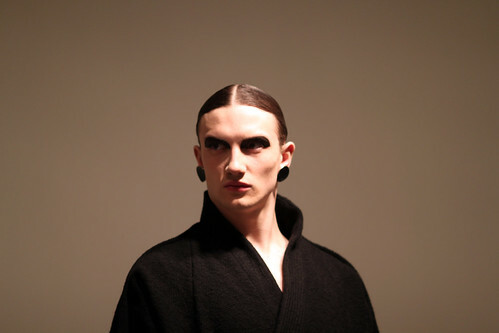 Although employing exclusively male models for his F/W '11 presentation, Siki Im's Facebook page lists his line as unisex, and indeed, the collection was presented worn by stern, androgynous, warriors. 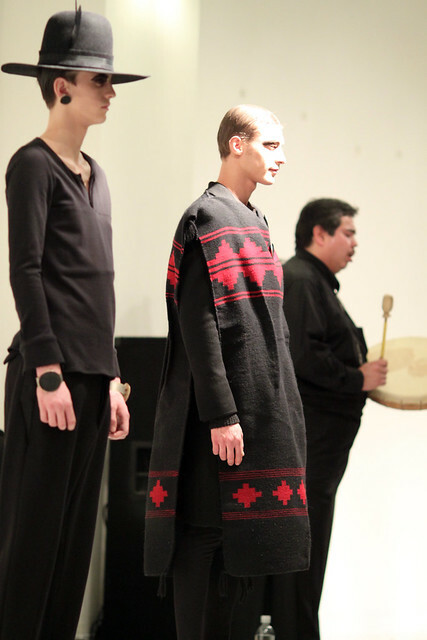 Siki Im clearly drew strong inspiration from Native American culture and spirituality. 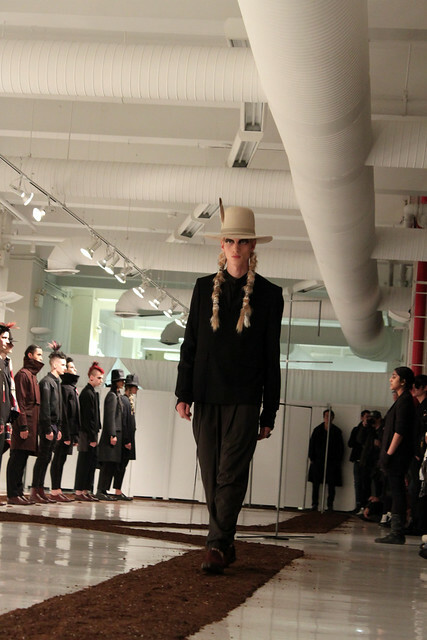 In an a minimal, industrial space, the models walked down a path of dirt that formed an angular figure 8, striding to the steady drumming beat and solemn chanting of live Native American drummers. Siki Im comes from an architectural background, and as such, pays close attention to construction and shape in his designs. While the gray-black and deep clay tones of the collection hearken back to the dusty Midwestern plains, the angular cut and asymmetrical, geometric lines brought an edgy, modernism to the collection. Tall hats with wide brims were worn low over the forehead, hiding the models eyes, and lending a touch of mystery, while round circular jewelry further accentuated the tribal association. The presentation was powerful and atmospheric, featuring a collection that draws from a culture of tradition and spirituality, while at the same time bringing a bold, yet wearable sensibility to the garments. Siki Im colloborated with weaver Tahnibaa Naataanii to create beautiful, woven knits featuring Navajo geometric patterns. Ok, I try to avoid the word, since it has become so overused, but there is no way around it, This guy is FIERCE!